Originally known as the Oakway Symphony, the Livonia Symphony Orchestra (LSO) was officially founded in 1973 by Francesco Di Blasi. In its 40-year history, the LSO has distinguished itself in terms of its conductors, musicians, concert programs and audience attendance. The Symphony’s current Music Director and Conductor, Volodymyr Shesiuk, joined the organization in 1992. 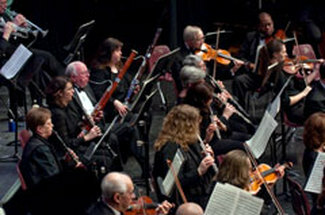 Under his direction, the Symphony’s 65 to 75 professional and semi-professional musicians perform a full concert series and a variety of special events throughout the year. The Livonia Symphony prides itself on programming that ranges from “fresh and fun” to challenging. In any given season, audiences can enjoy traditional classical and semi-classical works, Broadway and movie musical concerts and jazz and “pops” favorites. LSO concerts regularly feature acclaimed special guest artists. The Symphony also performs as part of the free “Music from the Heart” summer concert series sponsored by the Livonia Arts Commission and the Livonia Parks and Recreation Department. The LSO was recently honored as Livonia’s top volunteer organization and has received an award from the Livonia Community Foundation, as well as citations from the Governor, State Representatives and the City of Livonia.